Knowledge Access and Knowledge-Based Judgement. Colors as properties: Stroop-like effects between objects and their colors (W.R. Glaser, M.O. Glaser). 2. The eyewitness-misinformation effect: Distorted recollections based on contradictory information (R.F. Pohl, S. Schumacher, M. Friedrich). 3. Causal knowledge and the expression of uncertainty (H. Jungermann, M. Thüring). 4. Access to analog representations in memory for visually perceived forms: The facilitating effect of declarative knowledge (U. Lass et al.). 5. Interference in complex knowledge structures (U. Glowalla, M. Rinck). 6. EVENTS II: Modeling event recognition (R. Hoernig, R. Rauh, G. Strube). Knowledge Acquisition and Diagnosis. 7. Knowledge assessment based on skill assignment and psychological task analysis (J. Lukas, D. Albert). 8. Misconceptions and knowledge compartmentalization (H. Mandl, H. Gruber, A. Renkl). 9. Understanding and using worked-out examples: A computational model (P. Reimann, T.J. Schult, S. Wichmann). Learning Procedures and Tutorial Systems. 10. Learning program abstractions: Model and empirical validation (F. Schmalhofer et al.). 11. The acquisition of functional planning and programming knowledge: Diagnosis, modeling, and user-adapted help (C. Möbus, O. Schröder). 12. When can individual student models be useful? (G. Weber, A. Bögelsack, K.F. Wender). 13. Multiple mental representations of information in physics problem solving (R. Ploetzner, H. Spada). Complex Problem Solving and Applications. 14. Microworlds based on linear equation systems: A new approach to complex problem solving and experimental results (J. Funke). 15. Strategies for knowledge acquisition and transfer of knowledge in dynamic tasks (W. Putz-Osterloh). 16. Design and implementation of a representation system for human knowledge (W.H. Tack et al.). 17. The hypermedia system MEM and its application in evaluating learning and relearning in higher education (U. Glowalla et al.). Commentaries. 18. Knowledge representations and cognitive procedures (A.C. Graesser). 19. Knowledge and performance in complex problem solving (R.H. Kluwe). 20. Beyond a commodity view of knowledge in instruction (A. Lesgold). Author index. Subject index.. 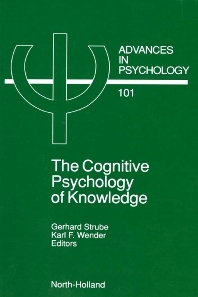 The present book is a result of a seven-year (1986-1992) national research program in cognitive science in Germany, presumably the first large scale cognitive science program there. Anchored in psychology, and therefore christened Wissenpsychologie (psychology of knowledge), it has found interdisciplinary resonance, especially in artificial intelligence and education. The research program brought together cognitive scientists from over twenty German universities and more than thirty single projects were funded. The program was initiated by Heinz Mandl and Hans Spada, the main goals of which were to investigate the acquisition of knowledge, the access to knowledge, and the modification and application of knowledge from a psychological perspective. Emphasis was placed on formalisms of knowledge representation and on the processes involved. In many of the projects this was combined with computer simulations. A final but equally important goal was the development of experimental paradigms and methods for data analysis that are especially suited to investigate knowledge based processes. The research program has had a major impact on cognitive psychology in Germany. Research groups were established at many universities and research equipment was provided. It also inspired a considerable number of young scientists to carry out cognitive research, employ modeling techniques from artificial intelligence for psychological theorizing, and construct intelligent tutoring systems for education. Close contacts with cognitive scientists in the U.S. have helped to firmly integrate the program with international research endeavours. Each year, one or two workshops were held. The present volume is the result of the final workshop which was held in September 1992. Selected results from seventeen projects are presented in this book. The volume is enriched by three guest scholars who agreed to participate in the final workshop and to comment on the chapters of the book.